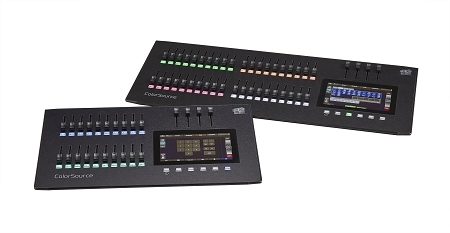 Available in two sizes, ColorSource® consoles provide hands-on control designed for the latest technology. These affordable, portable desks specialize in streamlined, plug-and-play setup; when the console powers up, it uses RDM to recognize intelligent lights in the rig and auto-populates them in patch. Simply use the on-board touchscreen to drag each fixture into place on a customizable stage map, and you’ll be programming in minutes. Whether you’re recording cues or working on the fly, these consoles have you covered, with faders that can be used to play back looks and effects or to mix the perfect color in your LED lights.